The area along Richmond Street at Duncan Street in Toronto is in for a shot of innovation, now that Aspen Ridge Homes has unveiled the plans for STUDIO ON RICHMOND. In an unprecedented melding of art and architecture, this new condominium will feature an 8,000 sq. ft. space that the Ontario College of Art and Design can use as a public art gallery and eatery. This meeting of the minds makes artistic, geographical and residential sense. With the need to expand, OCAD (which has been granted university status and is now OCADU) purchased three properties along Richmond. One of them will be bordered by STUDIO ON RICHMOND, so an intimate relationship is a natural. 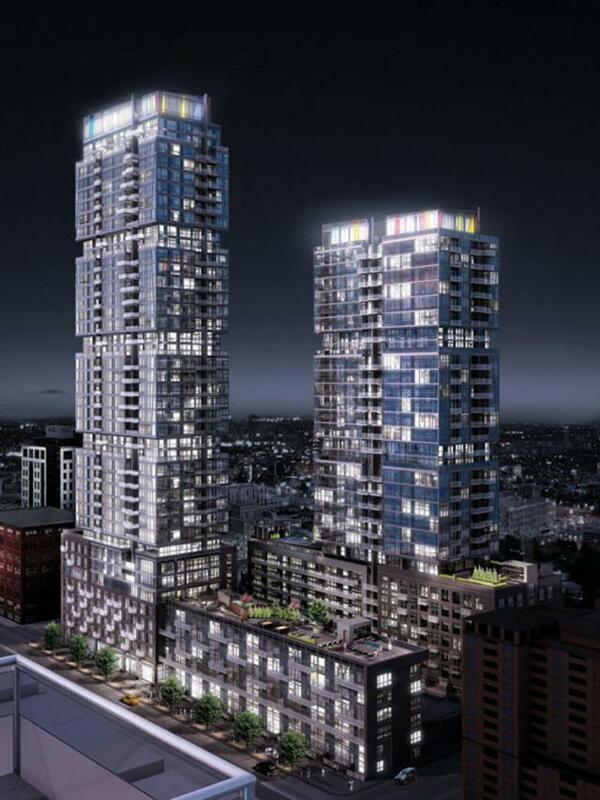 Aspen Ridge’s condominium will consist of two towers (31 and 41 storeys) designed by Quadrangle Architects to include a 9 storey podium that will house the gallery space. Now is the perfect time to consider a condo in this emerging area, which is being revitalized by the City of Toronto. Plans are in the works to plant trees, improve lighting, widen sidewalks and enhance existing park spaces on John Street and along Dundas Street West between Bathurst and University – offering an invigorating urban walking experience. STUDIO ON RICHMOND is located in the midst of restaurants, lounges, shopping, subway stations and cultural venues in this area, at the crossroads of Toronto’s Financial and Cultural Districts – only a few kilometers from the Gardiner Expressway. Residents will revel in this neighbourhood, which is an interesting mélange of Queen West and King West, a meeting of right brain and left, and all close to the subway and amenities that keep Toronto pulsing with excitement. The building’s head-turning modern architecture features a series of stacked cubes punctuated by terraces on some of the floors, as well as a green roof. Appointed by Mike Niven Interior Design Inc., extensive amenities encompass the entire 9th floor. “MeZone” is an outdoor Zen-like area with therapeutic hot tubs, a winter lounge with heated floors, indoor and outdoor yoga spots, steam rooms and tranquil spaces for reflection. “WeZone” is a distinct area with a communal outdoor barbecue space and individual barbecue spots for parties from four to 10. For indoor gatherings, WeZone features billiards, a bar and media lounge, plus a party area that can be sectioned off into smaller rooms to accommodate simultaneous events, as can the OCAD gallery. The condominium’s first floor is home to STUDIO FITNESS, and the second floor has an outdoor terrace with seating areas. STUDIO ON RICHMOND’s tower suites will have floor-to-ceiling windows, open-concept layouts and gourmet kitchens with spectacular Miele appliances. Builder incentives for the remaining inventory include 5% down and one year free maintenance fees, for a limited time.